This is the commonest of Britain's many daisies, familiar to all and so popular with young children as the raw material of daisy chains. Rarely more than 10cm tall, thisgrassland perennial has a basal rosette of spoon-shaped leaves and leafless stalks each topped by one individual (but composite) 'flower' comprising a central group of yellow disc florets surrounded by white ray florets. Especially when young the outer rays are often tipped with red, a feature that probably adds greatly to the appeal of this popular wildflower. 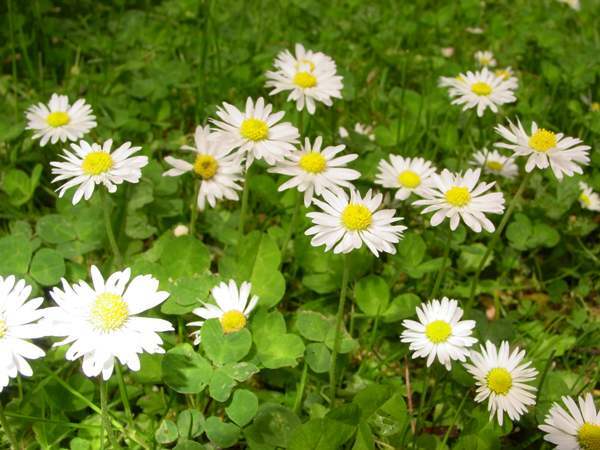 The overall diameter of a Common Daisy 'flower' is usually between 1.2 and 2.4cm. Daisies are common and widespread throughout Britain and Ireland, and this species is also common on mainland Europe and in many other parts of the world including North America. Common Daisies, or simply Daisies as most people refer to them, grow in lawns, churchyards, playing fields and parks - indeed they seem able to thrive almost anywhere that permanent meadows or other kinds of grassland are kept to a short sward either by moderate grazing, frequent mowing, or just the passage of people's feet. Flowers of Bellis perennis first appear in early spring and the plants continues blooming all through summer and into autumn. In May these robust wildflowers are usually at their very best. 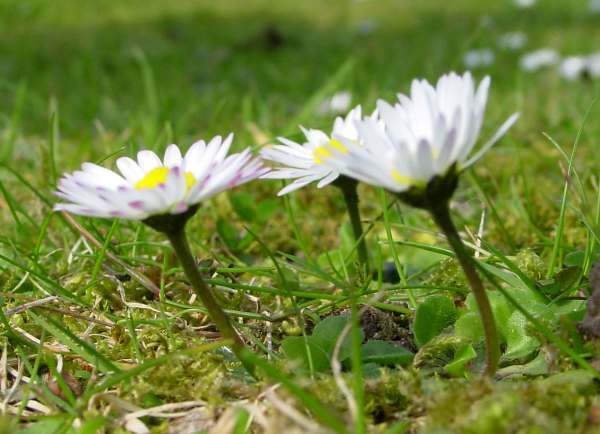 Popular not only in posies but even more so as the raw ingredients of 'daisy chains', Bellis perennis is an amazingly tenacious plant and can be very difficult to eradicate from lawns and golf greens. 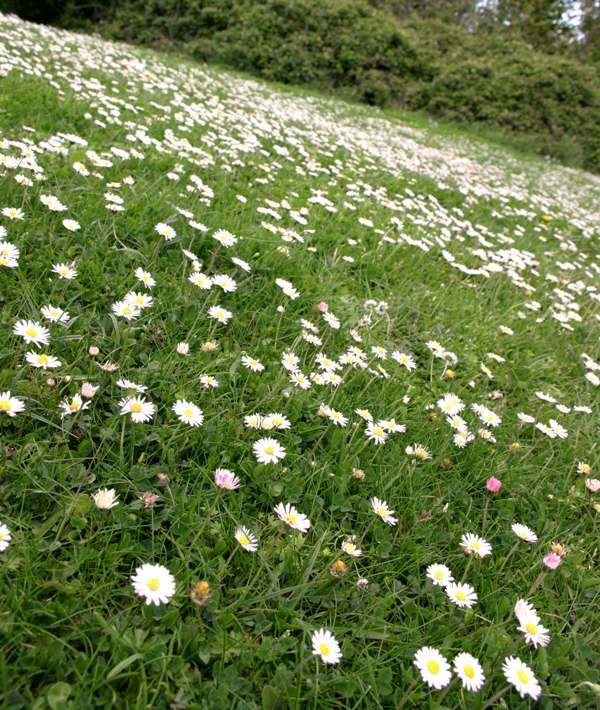 Once very common in almost all permanent pastures, Daisies are still among the most abundant of wildflowers wherever fertilisers and weedkillers are not extensively applied to fields, parks and lawns. Bellis, the genus name, comes from the Latin bella meaning beautiful. The specific epithet perennis means, just as it sounds, perennial.